Malaysia adopts the principle of separation of powers where the function of the legislature is to enact laws, the executive to govern in accordance with the law and the court to decide disputes and to apply the law. It is an aberration when the law provides that a court of law has to revert to a body of scholars in determining what the law in deciding disputes between parties is. However, this occurs in Malaysia in the area of Islamic finance where the law establishes a Shariah Advisory Council consisting of scholar of Islamic finance under the auspices of the Malaysian Central Bank. The decision of the Shariah Advisory Council is final and binding upon any arbitration bodies and courts. This paper adopts a doctrinal analysis approach in examining this issue from the perspective of the constitution and the legal system, and seeks to reconcile this aberration with the reality of the practice of law and the practice of Islamic finance in Malaysia. The paper then examines alternative to this mechanism. Abd Jabbar, Siti Faridah (2008) “The Shari’a Supervisory Board: A Potential Problem in Islamic Finance” Company Lawyer 29. Bank Negara Malaysia (1994) Money and Banking in Malaysia, Bank Negara Malaysia: Kuala Lumpur. Dusuki, Asyraf Wajdi et al. (2010) Implemen¬tasi Ibra’ dalam Produk berasaskan Harga Tangguh dalam Sistem Perbankan Islam: Analisis dari Perspektif Operasi Perbankan dan Maqasid Syariah, Research Paper (No: 16/2010), Kuala Lumpur: In¬ternational Shari’ah Research Academy for Islamic Finance. Markom, Ruzian et al. (2013) “Adjudication of Islamic Banking and Finance Cases in the Civil Courts of Malaysia” 36 Eur J Law Econ 1. Mohamad, Abdul Hamid (2013) “Some Observations on the Role of Judges in Settlement of Disputes in Islamic Finance Cases, SAC, Order 42 Rule 12A ROC 2012 and Ibra’”, in Financial Sector Seminar Series for Judges, organised by the Central Bank of Malaysia, 28-29 June 2013, Kuala Lumpur. Montesquieu, Baron (2001) The Spirit of Laws, (Thomas Nugent, Trans.). Kitchener: Batoche Book. Shuaib, Farid Sufian et al. (2010) Administration of Islamic Law in Malaysia: Texts and Material, 2nd Ed., Petaling Jaya: LexisNexis. Shuaib, Farid Sufian & Shuaib, Ibrahim Lutfi (2009)“Does Doctor always Knows Best? The recent Trend in Medical Negligence” 5:1 Biomedical Imaging and Intervention Journal e12. Yaacob, Hakimah (2010) “The Central Bank of Malaysia Act 2009 (Act 701): Enhancing the Integrity and Role of the Shariah Advisory Council (SAC) in Islamic Finance”, Research Paper (No. 6/2010), International Shari’ah Research Academy for Islamic Finance (ISRA). Zakaria, Zainur (1995) “The Determination of Questions of Islamic law or Hukum Syarak by the Civil Court and the Admissibility of Expert Opin¬ion” 24 INSAF 98. ISNAD Sufian Shuaib, Farid . "If You Don’t Trust Judges, Let the Scholars Decide: the Primacy of the Malaysian Shariah Advisory Council on Islamic Finance". 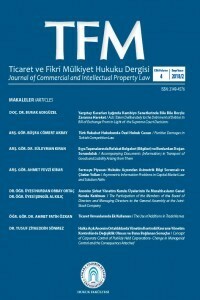 Ticaret ve Fikri Mülkiyet Hukuku Dergisi 3 / 2 (December 2017): 105-112.